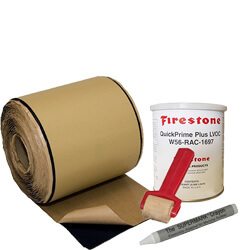 Firestone QuickPrime Plus LVOC is designed to clean and prime approved Firestone membranes prior to application of QuickSeam products where required by Firestone Specialty Products specifications and details. It may also be used to clean membrane prior to the application of Lap Sealant LVOC. It is formulated to meet V.O.C. requirements of 250 g/L (2.13 lb/gal) maximum. QuickScrubber Plus primer application system consists of a scrub pad and holder that allows application of QuickPrime™ Plus from a standing position. The QuickScrubber Plus scrub pad is secured in place to the bottom of the holder and has a threaded fitting to accept an extension handle (handle not included). One pad for the QuickScrubber Plus system is included with each kit. The bottom-bearing surface of the QuickScrubber Plus holder is slightly concave. When proper pressure is applied, the handle flattens out assuring that proper pressure is maintained. Each pad will prime about 100-200 ft. Long x 6"-7" Wide area.